Daniel Jones, the 23-year-old founder of the Church of Jediism, was ejected from a Tesco store in Bangor, North Wales, for wearing his Jedi hood while shopping for his lunch. Tesco staff believed that wearing the hood posed a security risk and therefore asked him to leave the store. Good to see that supermarket staff have both a keen sense of humour and an in-depth knowledge of Star Wars geek-dom! My Goodness. What a brilliant response to such an strange incident. Tesco's answer is the height of diplomacy! 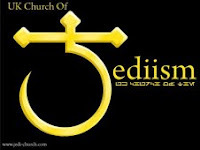 Incidentally, I simply can't understand how this Church of Jediism is so looked down upon. I mean, it is a quasi spiritualist institution founded on a work of science-fiction. Just like Scientology. Give it a few years and they'll have the likes of John Travolta and Madonna clambering all over it like a fat kid on a cup-cake! Good point. I'm stocking up on lightsabers first thing Monday morning!